Ogetpposition surfaces as soon as the integration process gets underway. Resistance starts to climb. You push to change the organization, and it starts pushing back. People gripe, whine and criticize, complaining about your objectives as well as the way in which you’re trying to reach them. Pretty soon the noise level begins to hurt your ears. Under ordinary circumstances, negative reactions this strong mean you’re doing something wrong. In the merger scenario, though, they more likely mean you’re doing things dead right. These are signals that you’re approaching a supercritical junction in the merger integration process. You’re coming up on what we call the yield point, one of the make-or-break stages en route to merger success. The organization had to struggle to get here. Now it’s gut check time. The resisters are saying, “We can’t (or won’t) take any more!” What you need to know is that you’re on the threshold of something big. You’re not on the verge of breakdown, you’re poised for breakthrough. Everything you’ve done up to this point is on the line. You’ve paid your dues, and you’re just one step away from payoff. You’re about to gain quantum advantage. But if you quit now, you get nothing. Lose your resolve before passing through the yield point, and it has all been wasted effort. Organizations tend to act that way, too. 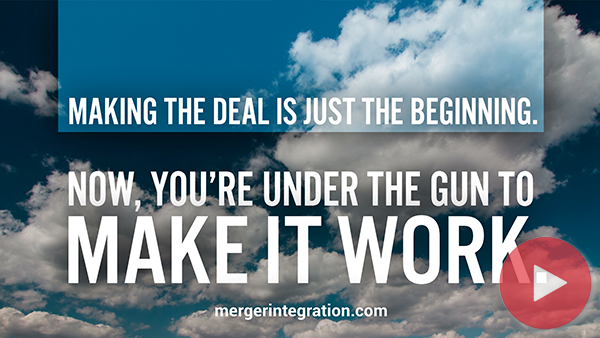 And in managing mergers, you need to keep the pressure on for change, even increase the pressure, until you hit the yield point. Then, with one more tiny push, the organization moves beyond that crucial threshold and enters the plastic zone. Here, change sticks. There’s no going back to the way things were. The resistance disappears. What we’re saying here is that the path to merger success isn’t a steady, consistent, incremental process where each effort you make toward integration is matched by parallel gains. In the early stages of consolidation, you put forth a lot of effort but seem to get little accomplished. Then you hit the yield point, and that last little bit of effort gives great rewards. A dime of work buys a dollar’s worth of change. Here’s why. Before your organization reaches the yield point, the various merger objectives are seen as possibilities. Maybes. Beyond the yield point, an objective has been realized, and is an absolute, uncontested fact. In the struggle up to the yield point, change is seen as optional. Once you move beyond it to the other side, change is mandatory. The critics cause trouble right up to the yield point. Then they quit fighting you. That particular war is over. So there you are—hanging on the precipice of failure, and standing on the edge of success. Your move. This is where you face the greatest temptation to give in, to cut your people some slack. It seems like an act of management kindness toward them, and it sure seems easiest for you. Conventional wisdom tells you to relent a little, to rest and gather strength. But softening your stance usually just stiffens the opposition. The resisters will take heart and find new faith in their cause if your determination starts to weaken. Now’s the time to hang tough. To stay the course. Push the organization past the yield point and enter the “plastic zone.” The yield point is like the sound barrier—it’s turbulent just before you reach it, but smooth as silk once it’s broken. WHAT YOU NEED TO KNOW NOW IS THAT THE ORGANIZATION IS ON THE THRESHOLD OF SOMETHING BIG. YOU ARE NOT ON THE VERGE OF BREAKDOWN. YOU ARE POISED FOR BREAKTHROUGH.